Now is it time to hang your clothes on the line? Not just yet. To make the whole process move along faster try these simple steps, then, as you become more comfortable with the process you can adjust them to meet your own needs. Before you put clothes on the line sort them quickly into your laundry basket starting with large items like sheets, table clothes and bath towels. Fold in half and place in the basket. When it’s time to hang just pull them out and pin them on the clothesline. Next pull out all pants and jeans and fold the legs with the seams together. Fold these in half with legs facing up for quick hanging. Then pull out all shirts, T-shirts and smaller towels and stack them in the basket by like items, starting with the largest items and ending with the smallest items. Next comes underwear, stacked in a flat pile with waistbands facing the same direction. Last in the basket are socks. Match socks into pairs and give them a good TUG to straighten and flatten. This may seem like a time consuming process, but you’ll quickly find it goes by fast and will eventually help you because you can pick up a stack of like items to hang and don’t have to constantly bend over to get each garment. And, when pulling clothes off the line they are already pre-sorted for you, which makes the folding or putting on hanger process go by much faster. Hang pants upside down, by the legs. Water wicks down and the weight of the water and the waistband will help pull out the wrinkles. Shirts and blouses are also hung upside down to help pull out wrinkles, but also to prevent little puckers that form when clothes are hung by the shoulder. To hang T-shirts, fold in half by the side seams, then in half again and pin by the bottom of the shirt. This will help prevent shirt corners from pointing out. Sheets and tablecloths should be folded in half length wise and hung by the corners. If needed, you can pin in the middle also. 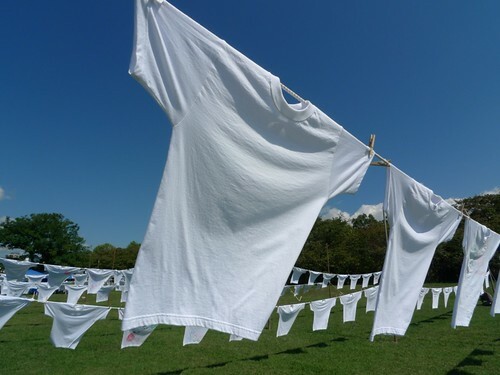 If you don’t want your unmentionables flapping in the breeze for all the neighbors to see, hang them on the opposite side of larger items so they are hidden. Socks are hung by the toes, while undies are hung by a side seam. To help save you from bending over to pull each item from the basket, place a small table, old TV tray or basket stand near the clothesline. When taking clothes off the line, fold as you go and you’ll find everything is ready to put away or hang on hangers by the time you reach the house. See which way the wind is blowing and hang smaller items in front (unless you’re hiding your unmentionables). If you hang larger items in front they will block the wind and take longer for your laundry to dry. Always bring clothes in at the end of the day. This helps the fabric last longer, prevents fading and saves clothes from night deposits by birds and other critters. Also, do not leave clothes pins on the line, as they can cause black marks which can be transferred to your clothing. Every once in a while run a clean rag over your line to clean it off. Now you’re ready to enjoy the benefits of line-dried clothing – lower electric bills, fresh, clean smelling clothes and time outdoors. Amazingly enough, hanging laundry on a line is very therapeutic. The simplicity of it seems to calm the mind and quiet the soul, even if it is for just a few minutes each week. To purchase laundry and clothesline equipment as well as other useful homesteading supplies check out Lehmans.com and Verrmontcountrystore.com. Talking of clotheslines, I have not repaired our clothes dryer given that it’s been broken and have begun drying out our laundry washing exterior!